President Woodrow Wilson at desk, signing paper. President Woodrow Wilson & second wife Edith Bolling Galt Wilson getting into convertible. President Woodrow Wilson speaking to crowd from porch of summer home in Shadow Lawn, New Jersey. President Woodrow Wilson shaking hands with line of Caucasian men and women. Wilson sitting on porch, reading newspaper. Woodrow Wilson walking from the White House. TLSs Mr. Wilson speaking to Congress; panning TLS House Chamber. CUs newspapers headlines announcing U.S. declaration of war on Germany (World War One; WWI). Woodrow Wilson and unidentified man standing and talking at top of stairs outside building viewing a parade. (France?). Traveling shots docks of New York, steam ships sailing in harbor. Woodrow Wilson sails for peace talks in Europe, Dec 4, 1918. Woodrow Wilson & wife Edith Bolling Galt Wilson ship. American flag flying from ship stern. Woodrow Wilson on bridge with sailors & officers. Low angle TLS dirigible airship passing overhead. 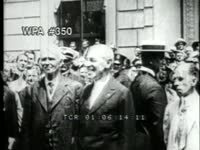 TLSs enthusiastic crowds greeting Woodrow Wilson in France. Woodrow Wilson in carriage with French President Raymond Poincare. Crowd gathered on street corner in France, Vive Wilson sign hanging across street in background. Girls in village costume waving. French woman sitting and dancing on lap of American officer. Parades, crowds. 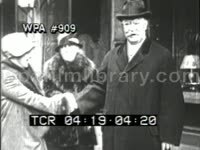 Woodrow Wilson in England, speaking to crowds, shaking hands with English dignitaries. 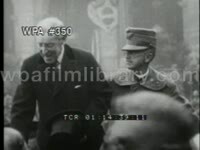 Woodrow Wilson being welcomed in Italy. Peace Conference in Paris, 1919: MSs of English Prime Minister David Lloyd George outside conference hall. Italian Premier Vittorio Orlando. French Prime Minister Georges Clemenceau outside hall. The Big Four - George, Orlando, Clemenceau & Woodrow Wilson - standing outside hall. Woodrow Wilson and wife, Edith Bolling Galt Wilson, leaving the hall, boarding boat, setting sail for home. 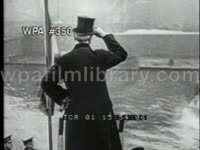 Woodrow Wilson waving top hat from stern of sailing boat. President Woodrow Wilson standing in convertible, waving to crowd during parade in Boston upon his return to the US. Senator Henry Cabot Lodge. Woodrow Wilson meeting with Senator Lodge & other Senators outside Congress. Senator Henry Cabot Lodge in heavy coat & hat. Senator Frank Brandages. President Woodrow Wilson in car. Cars pulling out of White House gates & onto Pennsylvania Ave. The signing of the Versailles Treaty: Exterior of Versailles. Woodrow Wilson, Georges Clemenceau, Vittorio Orlando, and David Lloyd-George shaking hands. Inside Hall of Mirrors. CU treaty's signature page. Woodrow Wilson & Mrs. Edith Wilson exiting Versailles. Panning Senator Henry Cabot Lodge and the Senate Foreign Relations Committee. 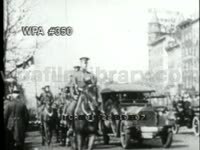 Woodrow Wilson touring America, promoting the League of Nations, beginning in Columbus, Ohio, September 4, 1919: riding carriage, crowds, speaking engagements, parades, etc, his wife Edith Bolling Galt Wilson accompanies him. Wilson speaking to crowds in St. Louis. At the amphitheater in Los Angeles, California the crowd spelling out, "Welcome" in cards and waving American flags. President Woodrow Wilson, Edith Bolling Galt Wilson and Vice-President Thomas Riley Marshall. Car bearing American flags passing camera. MS President Woodrow Wilson fanning himself in car. Woodrow Wilson speaking to crowd. People at crowded train station. Exterior White House. 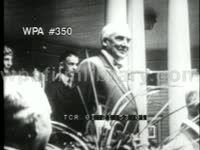 MS Mr. Wilson on porch of White House with aides. Woodrow Wilson bundled under blankets in car, looking unwell. Crowds outside Woodrow Wilson home. Wilson exiting house, talking to crowd. Woodrow Wilson and wife Edith Bolling Galt Wilson peering out second floor window. Woodrow Wilson when he signed the paper that put us into World War. Woodrow Wilson writing at a desk, cut to MS of him posing in his den. In the days of his retirement Frail Wilson sitting in car. 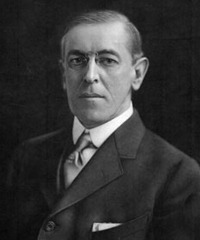 MCU Woodrow Wilson seated in office. MCU Woodrow Wilson seated at desk writing or signing papers (documents). Woodrow Wilson chatting with friends after returning from France and the League of Nations sessions. 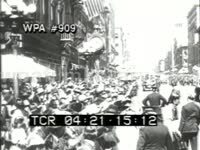 Woodrow Wilson driving through American city streets, tipping hat to crowd. President Woodrow Wilson speaking from patio of Shadow Lake, NJ, home. MS of President WOODROW WILSON throwing out the first ball of the Seantors season, 1913. 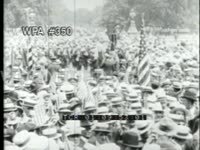 1918 Newsreel of jubilation & celebration in New York City after signing of Armistice, ending World War I (WWI): cheering crowd hold newspapers w/ headlines, "Germany Quits" & "Germany Surrenders"; puppet effigy of Kaiser Wilhelm holding white flag of surrender; many American flags being waved by crowd; panning MS group of Red Cross workers, one wearing Uncle Sam outfit. Panning TLS lare group of American servicemen (navy & marines) standing on deck of transport boat. MS President WOODROW WILSON speaking to sailors on boat. Panning MS U.S. sailors & marines resting on deck of transport ship. Over the shoulder MS group of servicemen waving from deck of boat sailing in New York Harbor, Statue of Liberty in BG. Nice TLS Statue of Liberty. MS happy white female Red Cross nurse handing out something to servicemen on boat. MSs nurses tending to bed-ridden war veterans in hospital. MSs war vet trying on artificial limb (left leg), putting on pants. MS war vet in rocking chair weaving basket in hospital. The end of World War One, Woodrow Wilson visits Italy: MS of him walking through the streets, tipping his elegant hat to delighted people lining the streets. MS of Wilson standing on a balcony and waving to the Italian crowd below. Baseball, Americas pastime. President Woodrow Wilson throws out first pitch from stands. Two boys seen taking a sneak peek from fenced area. (sneaking, cheating, peeping toms, could be used for side-show material). Crowds waving to camera. Massive crowd leaves stadium, exit signs above (film seems sped up). WOODROW WILSON looking out window. Seen at desk signing paper. Capital Dome with American flag blowing in wind. Woodrow Wilson and second wife. MS of President WOODROW WILSON at a desk in his office. MS's of neutrality protesters on a city street. Women carry boards and American flags. MSs Henry Ford posing for cameras with pacifists PAUL KELLOGG and JANE ADDAMS in Washington, 1915. MS President WOODROW WILSON looking out window in office, taking seat at desk; CU Woodrow Wilson posing, looking sullen. MSs Henry Ford meeting with inventor THOMAS EDISON (Thomas Alva Edison), the two chatting, laughing. Ford and pacifists sail for Europe, 1915: LS/TLSs ocean liner Oskar II at dock, tugboat sailing beside her; panning MS Henry Ford with pacifists posing for press aboard peace ship; TLS crowd mobbing someone on dock; TLS crowd waving bon voyage to Oskar II; LS man swimming in ocean, allegedly chasing liner. 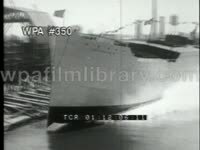 Newsreel camermen on dock; LSs Oskar II departing. MS of Woodrow Wilson sitting at a desk and signing papers. The declaration of War and America's entrance. Montage of enlisted men at boot camp (lots of wide and tight LS's of training exercises, many of which are rather dated and ridiculous looking). Tight and wide LS's doughboys boarding trains bound for the front lines, a huge send-off, includes an excellent MS of a large crowd waving small American flags, followed by tight LS's of the soldiers boarding ships and setting sail for the front. MS Woodrow Wilson and General JOHN J. PERSHING inspecting troops. MLS troops marching. MCU Woodrow Wilson in office. Establishing LS League of Nations building w/sculpture Geneva, Switzerland. Interior LS/MLS League of Nations assembly meeting in session. WWI Era Montage: Various shots of large field and rail cannons firing. LS mast of ship sinking (not the Lusitania), newspaper spinning at cam w/ headline, LUSITANIA SUNK BY SUB. MS President WOODROW WILSON working at desk, newspaper copy spinning at cam w/ headline: UNITED STATES DECLARES WAR! TLS American troops marching in Washington DC w/ Capitol Dome in BG, newspaper spinning at cam w/ headline: YANKS ARE COMING! Quick MS Gen. JOHN J. PERSHING riding horse. LSs (American? British?) 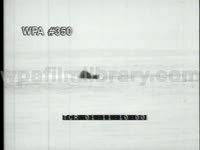 troops advancing over glen; MS small field cannon firing; LSs explosions on battlefield; LS several fighters in air; MSs tanks in combat (battle). (Recreation): Men working inside office of War Labor Administration. 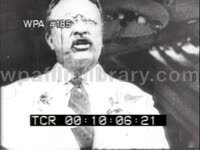 MS Secretary of War Newton Baker giving speech. MS President Woodrow Wilson working in office. Shots of Democratic candidate for President Woodrow Wilson on campaign trail in 1912: meeting public, boarding trains and automobiles, shaking hands, etc. MSs Woodrow Wilson on the campaign trail. Woodrow Wilson shaking hands, making speeches from caboose of Pullman train; crowd shots. Woodrow Wilson doffing hat from backseat of Model T, large bouquet of flowers beside him. Woodrow Wilson exiting unidentified company office building, doffing his straw boater hat. 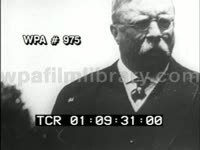 Wilson and aides exiting building, Woodrow Wilson waving fedora & smiling to crowd. Woodrow Wilson sitting in car, smiling. Woodrow Wilson standing in convertible, waving to large crowd assembled to see him. Woodrow Wilson, sitting in wicker rocking chair on porch in Princeton, reading telegrams, laughing; aides flank him. MS President Wilson standing at window of office, then walking away. Woodrow Wilson talking on two-piece telephone. Wilson digging dirt at tree planting ceremony. President Woodrow Wilson meeting with William Jennings Bryan in office. William Jennings Bryan speaking from bunting-draped platform at rally. Bryan standing, then sitting in backseat of Model T. Democratic National Convention, held in Baltimore in June of 1912: EST shot convention hall, crowd milling about outside; TLS/MSs delegates on floor, speakers speechifying. Nominated Woodrow Wilson & aides outside unidentified building, crowd of on-lookers lining periphery. Exterior MS/GV Federal Reserve building. Interior MS of WOODROW WILSON reading document at desk. 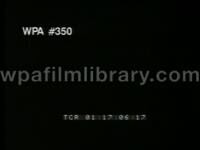 CU "Federal Trade Commission" logo. MCU WOODROW WILSON. CU WOODROW WILSON waving. POV crowd of supporters (men & women) as seen from platform of moving train. MCU of WOODROW WILSON on moving train platform. Professor Woodrow Wilson in collegiate robes marching in unidentified outdoor procession, possibly at Princton University. 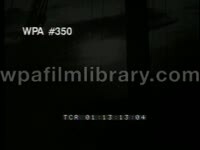 Slo-mo MCU Mr. Wilson (allegedly taken when he was New Jersey governor). Woodrow Wilson speaking with unidentified group of men. MS pedestrians walking. 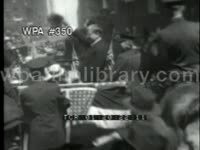 MS Woodrow Wilson shaking line of citizens' hands. MS women registering to vote, American flag hangs behind them. MCU woman voting. CU hand placing vote into ballot box. MCU woman flipping through papers. MS woman seated at label w/sign reading "Election Registrars", men & one woman are lined up behind her (1950's). 1912 newsreel: MLS pan of men gathered at train station for WOODROW WILSON whistle-stop campaign. MS/MLS WOODROW WILSON on train platform shaking hands w/supporters. GV cheering people gathering at WOODROW WILSON Inauguration. CU WOODROW WILSON tilting his hat w/a smile. WOODROW WILSON re-election, Inauguration day, crowd waving American flags. President Woodrow Wilson writing at desk (declaration of war). CU newspaper 'President Proclaims U.S. At War.' Patriotism, American flags, Uncle Sam. Men lined up to enlist, signing up, draft lottery. Man excitedly shakes hands, drafted. Enlisted men, new recruits, getting haircut, training, drilling, uniforms issued. Soldiers with puppies. Soldiers running up hill towards camera, bayonet training. 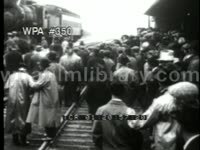 Troops departing, women waving, passenger train passes camera with soldiers waving hats. Steady stream of soldiers, board ship. Soldiers waving aboard ship. MCU profile Woodrow Wilson giving inaugeral speech. LS pan massive crowd at the presidential inaugeration. Excellent newsreel of 1910's crowds gathering outside baseball parks on game day (a literal litany of Gatsby hats), followed by LS's of baseball players warming up, taking the field; good shot of the grounds crew rolling tarp over a field during rain delay. 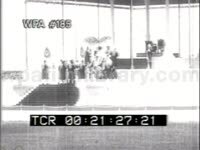 MS of President WOODROW WILSON sitting down in stadium, then throwing out the inaugural ball. Great MS of announcer in filed with huge megaphone. More stadium crowd shots. High angle LS's of players making hits, taking bases. Great MS of kids peeking through hole in wood fence; when home run ball sails over them they give chase. Great early baseball footage, nostalgia. Inauguration Day, March 4, 1913: President William Howard Taft & President-elect Woodrow Wilson shaking hands outside the White House, then getting into carriage. Presidential carriage and entourage (including an officer's unit of the US Army Cavalry) making way through streets of Washington, DC. Women waving American flags, newsboys cutting through crowd, etc. Gallery at the Capitol Building draped with flags. 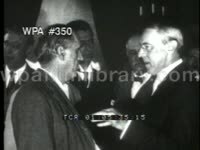 Woodrow Wilson being sworn into the office of President by Chief Justice Edward White. 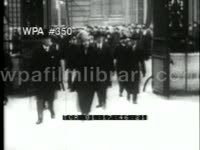 Inauguration of President Woodrow Wilson, United States (Mar 4, 1913): TLS Supreme Court Justices walking down aisles, taking seats in gallery, followed by former President WILLIAM HOWARD TAFT and British Ambassador to the United States Lord JAMES BRYCE. 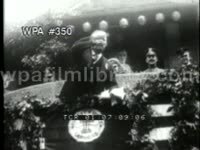 LS/MSs Chief Justice EDWARD D. WHITE administering Oath of Office to WOODROW WILSON. LS/MSs Wilson delivering Inaugural speech. TLS soldiers in cadet-like uniforms marching in inaugural parade. GV carriage carrying Presidents Wilson & Taft through Washington, DC. TLSs Army and Navy marching. Unknown Soldier Funeral Procession, Washington DC, November 11, 1921: LS flag-draped casket of unknown WWI soldier being loaded onto caisson, reroute to final resting place at Arlington National Cemetery. TLS U.S. Army & Navy officers accompanying carriage. LS sailors marching with rifles shoulder bound. MSs former President WOODROW WILSON & wife EDITH BOLLING GALT riding in open carriage driven by two African-American men. 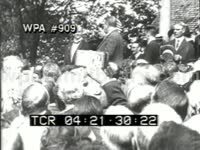 Woodrow Wilson standing on patio of home in Shadow Lawn, New Jersey, speaking to crowd. Woodrow Wilson & group of Caucasian men walking in parade. Woodrow Wilson, wearing top hat, standing at grandstand. Woodrow Wilson greeting citizens, even a baby. 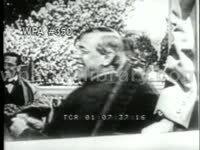 A frail, ailing Wilson huddled beneath blankets in backseat of open convertible (shot near the end of his life).